Usually when we talk to organizers, they can trace back their decision to become community organizers to an event, experience or emotion. Yuki, how was it for you? It was pretty similar for me as well. In 2011, I attended ‘Google Developer Day Japan’. There were already some developer communities present, but they were run mostly by male organizers. I had to do something about that as I wanted to meet other women Engineers. That’s why I started a community soon after along with 3 other organizers. How has GTUG Girls developed since then? Since we started GTUG Girls in June of 2011, we grew to 436 members . The local developer ecosystem in Japan is very advanced, there are hundreds of communities, often very small and specialized. People tend to be members of several communities based on topics they’re interested in. That is why a clear positioning is important for us - we have meetups every 2 months with focus on beginner level skills. I am happy to see more women becoming organizers and starting new communities. We can share resources and host events together. How many co-organizers do you have? We have a pretty big team, there are 29 co-organizers. We try to involve the whole group in the production of our meetups based on their time availability. We don’t have a formal team structure, the team knows what needs to be done and we make it happen. What tools do you use for chapter management? We use a Google Groups mailing list and team Slack channel (we have another separate community members Slack channel). To promote our meetups, we use an event management service that is very popular in Japan called Connpass. We use Twitter for promotion, announcements and operative communication. During events, attendees also tweet a lot - to summarize talks , to comment or to ask questions. It would be a codelab that starts with a short 3-5 min opening talk about housekeeping rules. Then we have a ‘snack break’ (everyone brings something to share) to get to know each other, followed by the codelab session. Just out of curiosity, what is a typical snack for your meetup? Rice crackers (laugh). For GDG meetups, it’s usually ‘pizza and beer’, but we try to promote a healthier lifestyle (laugh). How do you find speakers for your events? Based on the meetup topic, we research on Twitter or reach out to GDEs for suggestions. I try to encourage my co-organizers to become speakers, there are still not enough women speakers in general. To help them overcome fear of public speaking, I encourage them to present a shorter talk together with 1-2 other speakers in one session. That helps to offload some of the pressures and they become more confident. Yuki, what do you like the most and the least about being a community organizer? My favorite thing is to meet fellow women Engineers. I want to help them with their skills and becoming confident speakers. It is great to see more women entering the industry, but there is definitely room for more. 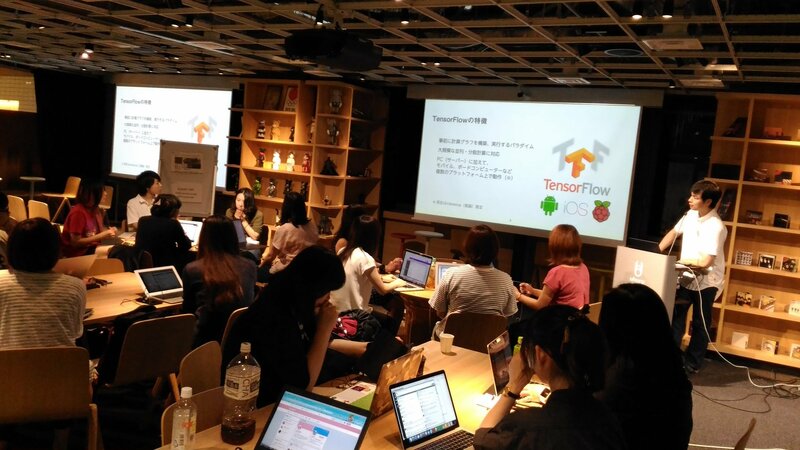 At my first Google I/O in 2011, I met only about 5 other women attending from Japan, last year (2017) there were almost 20. How do you balance being a CEO of your own company and a community organizer? Nowadays, I rely on my co-organizers to do most of the operative tasks and I mostly just attend the meetups (laugh). Obviously, I was very involved in the early stages of building the community, but I had to step back a bit when I started my own business. What are some challenges you are experiencing in your chapter at the moment? We really want to establish a connection channel to university students, as we’d like to see more of them coming to our meetups.